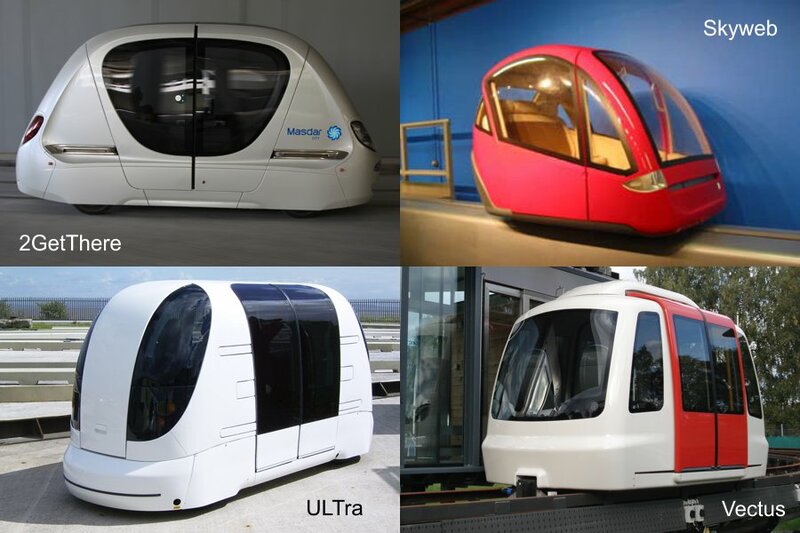 The selected projects, described below, all relate directly or indirectly, to Personal Rapid Transit (PRT). Project: Supplier procurement solicitation documents were prepared including two different ATN layouts, system requirements and specifications and bid proposals. Proposals were evaluated and site visits undertaken to the two preferred suppliers. 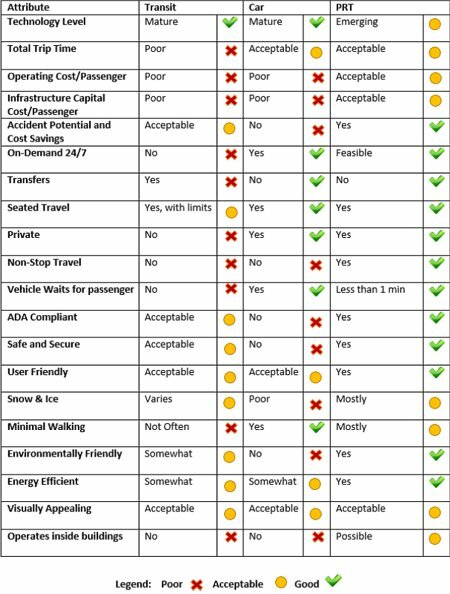 A refined ATN/shuttle bus comparison was prepared based on ATN bid prices and estimated shuttle bus costs. Role: Subconsultant to WK Dickson responsible for ATN and shuttle bus technology issues. 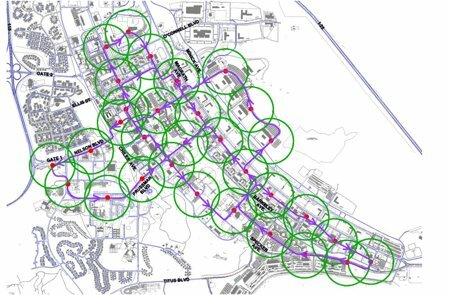 Project: Civil engineering students at the University of Utah were tasked with studying the feasibility of a PRT solution in the Park City/Summit County resort area. Automobile traffic is rapidly increasing resulting in unacceptable congestion issues. A solution that does not require road widening is being sought. PRT Consulting was engaged to help teach the students about PRT and guide their work. At the completion of the student work, PRT consulting adapted their results to provide a corrected conceptual analysis of PRT feasibility. Project: The client had a team of consultants investigate different options for utilizing an abandoned rail corridor to connect the corporate campus to a commuter rail station - a distance of approximately five miles. Modes considered included commuter rail, light rail, bus rapid transit, ATN and aerial ropeway. 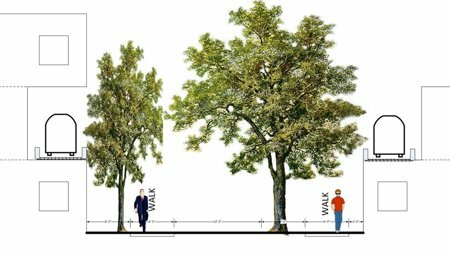 The study was complicated by the need to preserve right-of-way for a pedestrian/bike facility as well as for the potential reinstatement of rail service. Role: Prime consultant for ATN and ropeway with assistance from Engineering Services Group. 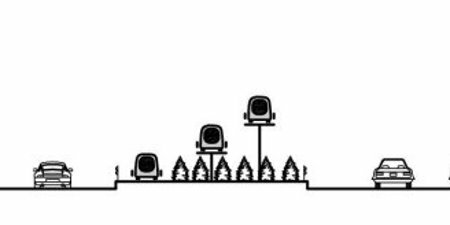 Project: This preliminary personal rapid transit feasibility study involves comparing the feasibility of a PRT solution to a shuttle bus solution for serving remote surface parking facilities. The work involved developing comparative routes and operations for both systems. Life cycle costs (including supplier input) were compared and found to be similar. Passenger service levels were found to be significantly improved with PRT. Opportunities for funding/financing the system were investigated including an evaluation of rates and charges at comparative airports. Recommendations were made for how to proceed with PRT system implementation. 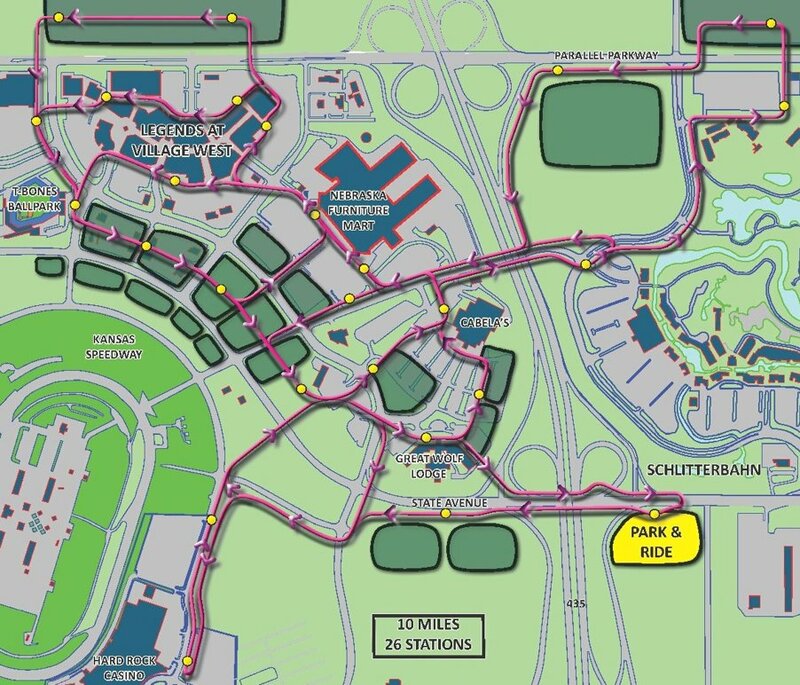 Project: This project involves investigating automated transit network (ATN - personal and/or group rapid transit) solutions for a large corporate campus needing to expand, yet already suffering from traffic congestion. 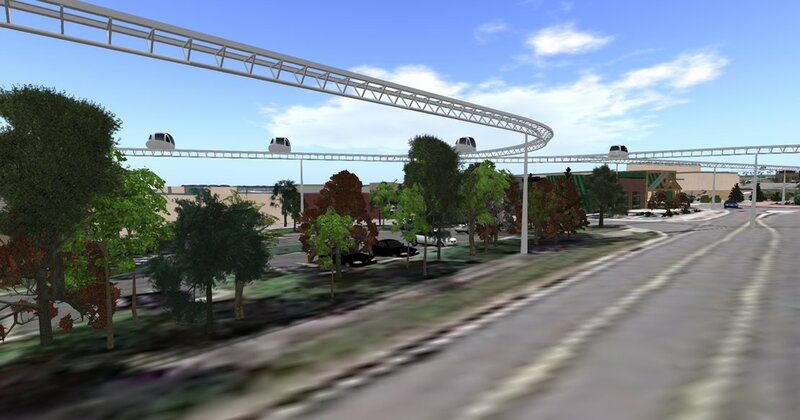 The project has included investigating layout and phasing considerations, headway reduction with advanced control systems, SWOT analysis, guideway structural and cost evaluations, mode preference, enhanced ridesharing strategies and a hierarchical mode evaluation. Ground-breaking work undertaken on this project included maximizing the capacity of ATN systems while constrained by the capabilities of existing technology complying with existing standards. Nine different capacity-enhancing techniques were evaluated and modeled. 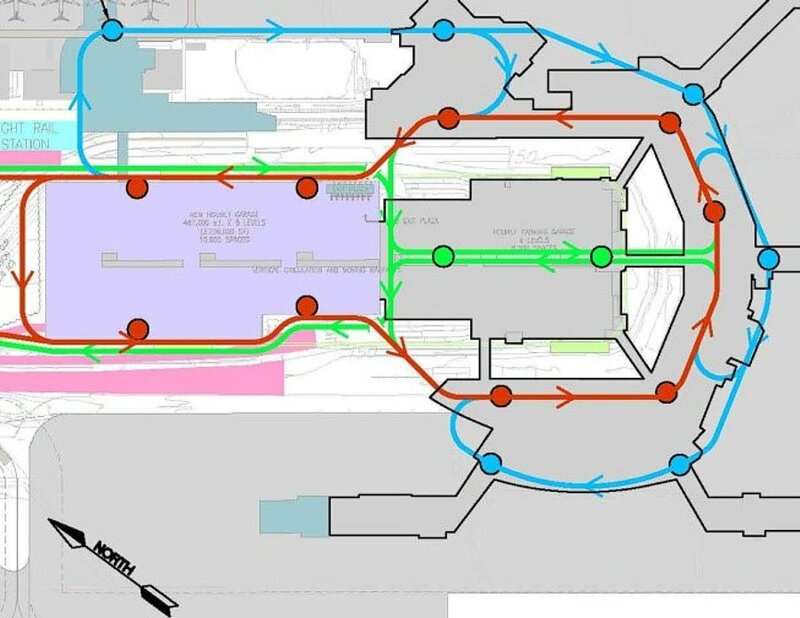 A combination of the most promising techniques resulted in the 29-station network depicted below being able to accommodate 13,000 passengers per hour with six-passenger vehicles at three-second headways. Project: A previous multimodal transit corridor alternatives feasibility study had found bus rapid transit (BRT) to be the preferred solution for the corridor in question. Since PRT systems subsequently came into public service, it was decided to update the study to compare a PRT solution to the BRT solution. The total costs for PRT were found to be similar to those for BRT. However, the shorter walking distances and wait times involved with the PRT solution were found to attract three to four times as many riders. Project: The concept of Automated Transit Networks (ATN) - in which fully automated vehicles on exclusive, grade-separated guideways provide on-demand, primarily non-stop, origin-to-destination service over an area network - has been around since the 1950s. However, only a few systems are in current operation around the world. ATN does not appear "on the radar" of urban planners, transit professionals, or policy makers when it comes to designing solutions for current transit problems in urban areas. This study explains ATN technology, setting it in the larger context of Automated Guideway Transit (AGT); looks at the current status of ATN suppliers, the status of the ATN industry, and the prospects of a U.S.-based ATN industry; summarizes and organizes proceedings from the seven Podcar City conferences that have been held since 2006; documents the U.S./Sweden Memorandum of Cooperation on Sustainable Transport; discusses how ATN could expand the coverage of existing transit systems; explains the opportunities and challenges in planning and funding ATN systems and approaches for procuring ATN systems; and concludes with a summary of the existing challenges and opportunities for ATN technology. The study is intended to be an informative tool for planners, urban designers, and those involved in public policy, especially for urban transit, to provide a reference for history and background on ATN, and to use for policy development and research. Project: This project involved an investigation into the ability of four different modes of transportation (three automated) to adequately connect a rapidly-growing corporate campus to a commuter rail service. The primary focus was the ability of each mode to deal with a surge of passengers arriving at one time. 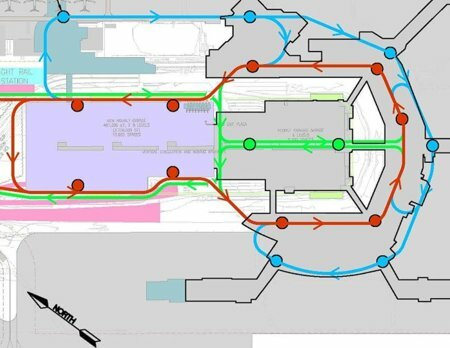 Some modes were unable to meet the demand and were re-evaluated in a situation where two stations were connected to the campus instead of just one. 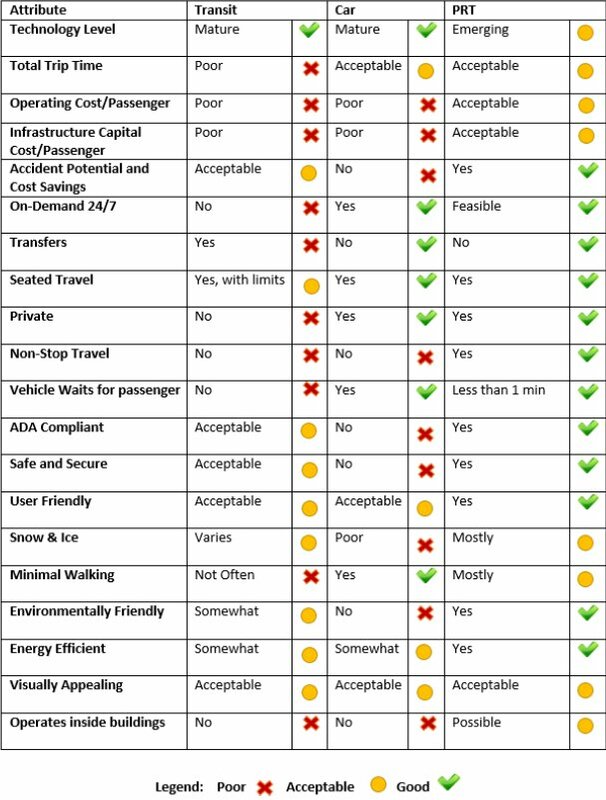 The modes evaluated were personal rapid transit (PRT), group rapid transit (GRT), automated bus, and articulated commuter bus. The first three modes use relatively small vehicles, are fully automated and operate on exclusive guideways. The commuter bus operates on city streets. 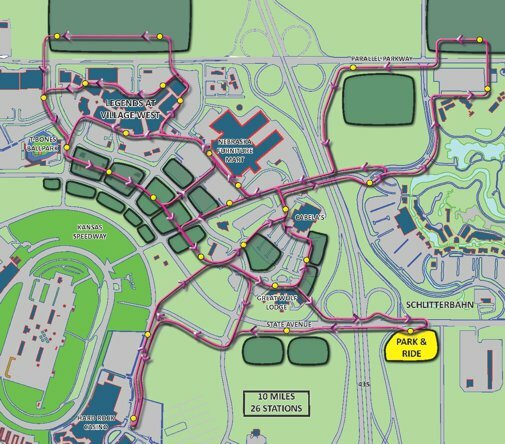 Automated people movers and 35-passenger buses were briefly examined but quickly eliminated from detailed consideration. Project: T.Y. Lin was charged with assessing light rail, bus rapid transit and automated transit networks (ATN - personal and/or group rapid transit) for a 16 km corridor in China. The anticipated demand was for 10,000 passengers per hour per direction. The assessment considered ATN characteristics, demand/capacity, preliminary alignments, level of service, economic impacts/advantages, flexibility for expansion, interconnectivity, estimated costs, new energy and materials as well as environmental and construction impacts. Project: The client was investigating the feasibility of a 600' long, fully-enclosed, pedestrian bridge, including moving sidewalks, crossing a highway and connecting two large buildings. The bridge would tie into the first floors of the buildings and extensive vertical circulation systems (elevators, escalators and stairs) would be required. PRT Consulting was requested to investigate the feasibility of replacing the bridge with PRT or GRT (group rapid transit). Two alternative alignments were investigated. The first matched the bridge concept and included about 750' of two-way guideway with stations at the first floor level of the buildings. 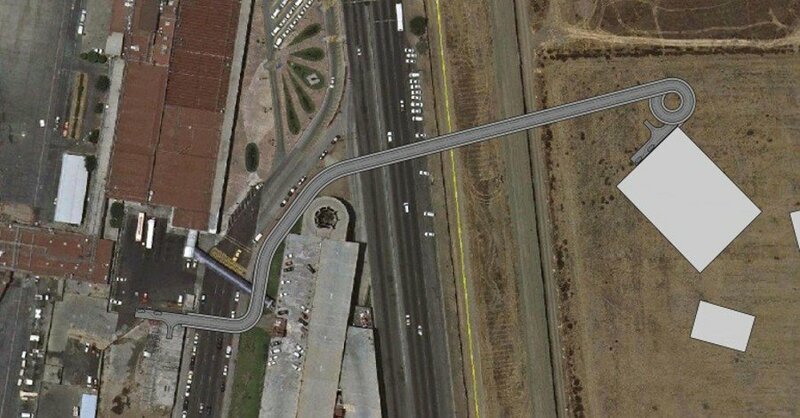 The second had about 1,400' of two-way guideway. 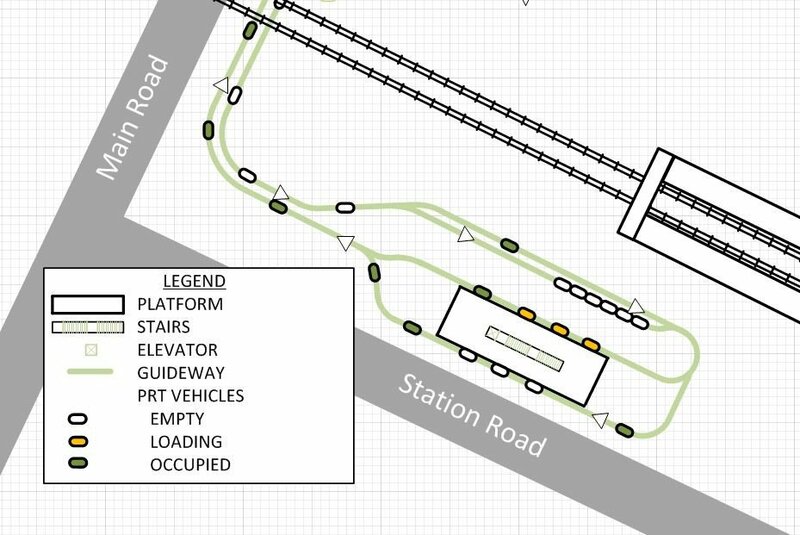 The extra guideway length was utilized to slope down to stations at ground level, thus obviating the need for additional vertical circulation facilities. 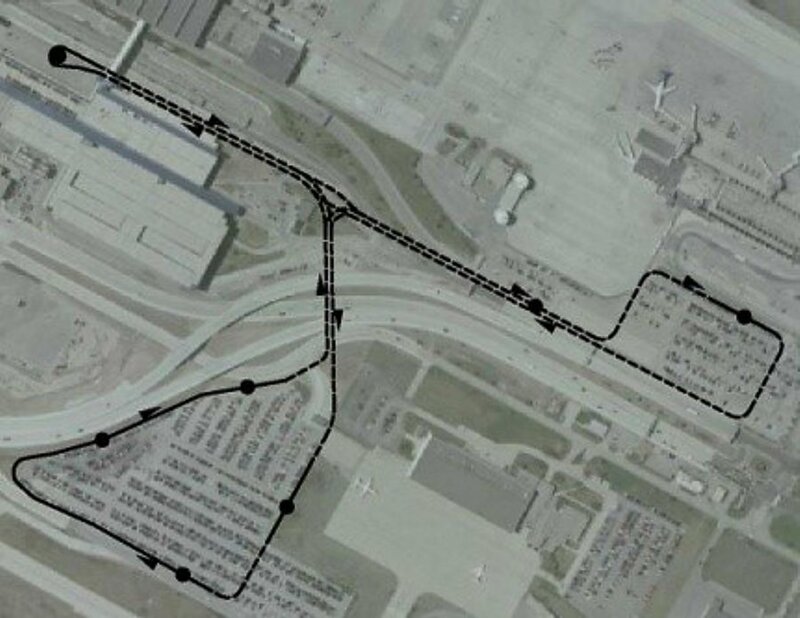 Project: The client required an assessment of the global PRT market with an emphasis on airport opportunities. PRT assessed the PRT concept for its applicability to both the urban and airport markets worldwide. The historic, current and future markets were assessed by segment, barriers to entry were determined and an overview of existing suppliers was provided. A review of critical providers/partners for PRT implementation was undertaken. 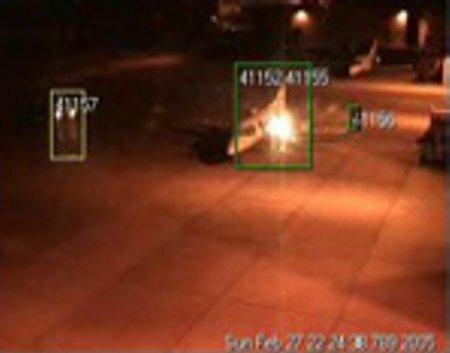 An airport-focused assessment of opportunities included analyses of numerous specific airport situations. A workshop meeting was held to educate Toffler Associates on PRT characteristics and present the results of the assessment. Role: Subconsultant to Toffler Associates responsible for preliminary PRT market assessment. Contact: Christopher Juniper, Natural Capitalism Solutions Inc.
Project: This study involved investigating options for extending the PRT system off-Post into the surrounding communities. Financing and funding mechanisms were investigated. An analysis of the cradle-to-grave sustainability of PRT compared to other modes was undertaken. The likelihood of driverless cars reducing congestion in the near term was investigated. 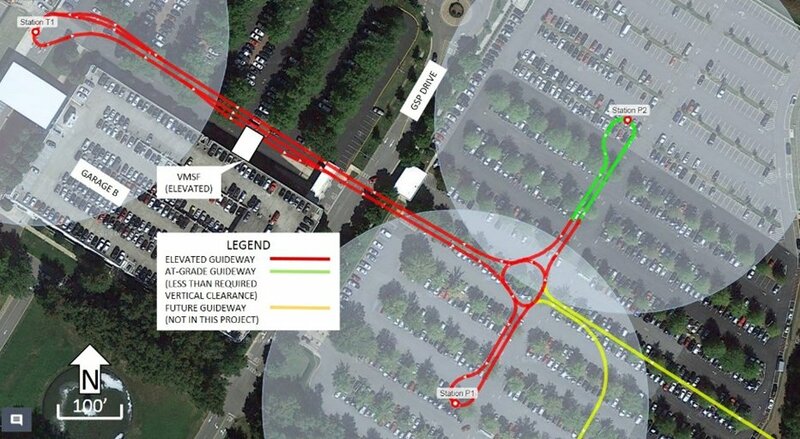 Contact: Stanley E. Young, P.E., Ph.D.
Center for Advanced Transportation Technology. Project: Investigated the feasibility of PRT to link retail businesses, speedway, ballpark, casino, water park, and transit and to improve accessibility while reducing parking requirements. 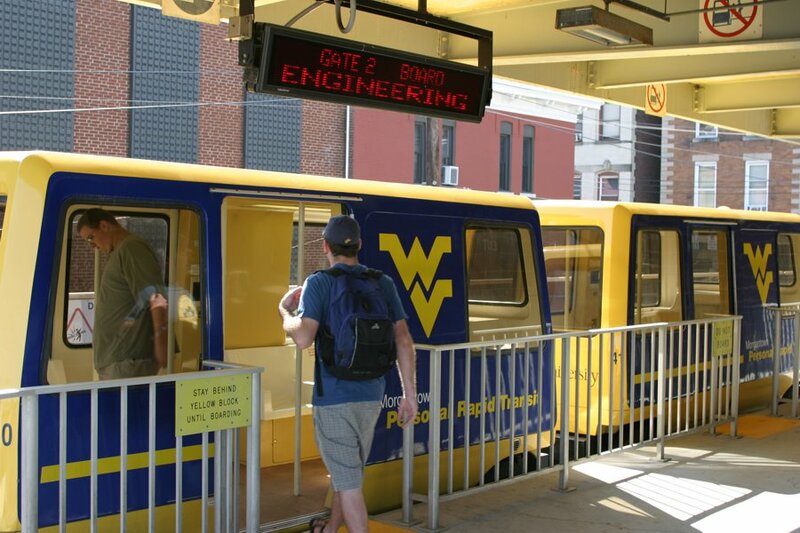 The PRT system was designed to accommodate 5 million annual passengers and had ten miles of guideway and 26 stations. The project included literature review, conceptual design, ridership estimates, PRT simulations, code compliance, ownership and financing, as well as benefit/cost evaluation. Project: PRT feasibility study including stakeholder and public participation, alignment and station location alternatives analysis, trip demand matrices, simulations, benefit/cost analyses and financial modeling. 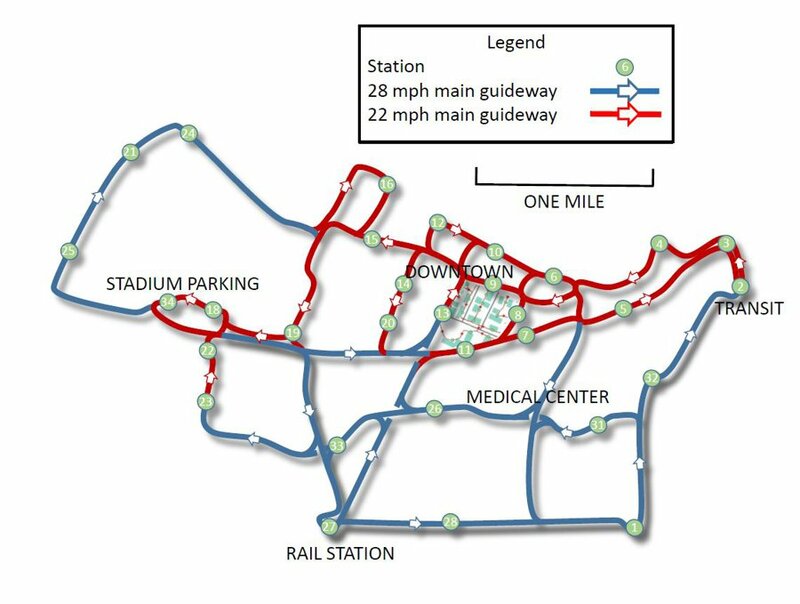 The PRT system was designed for 19.5 million annual passengers and had 23 miles of guideway, 35 stations and 800 T-Pods. Project: Constructed an at-grade track with a short segment of elevated track. Utilizing a small automobile, conducted operational testing under differing conditions. This phased project was completed over two winters and involved natural and manufactured precipitation events including snow and freezing rain. 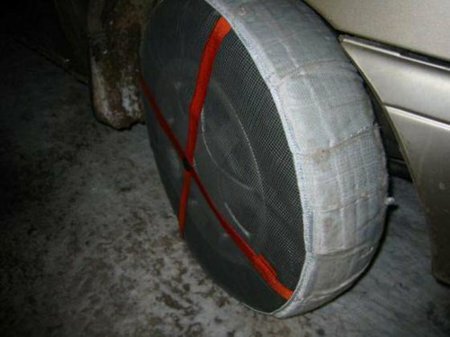 In addition to determining dynamic friction values, the project explored means and methods for mitigating the effects of adverse weather. Project: Analysis of the business and technical capabilities of four PRT vendors. The project was based on publicly-available information and examined the strengths and weaknesses of 2getthere, Vectus, Skyweb express and Ultra. 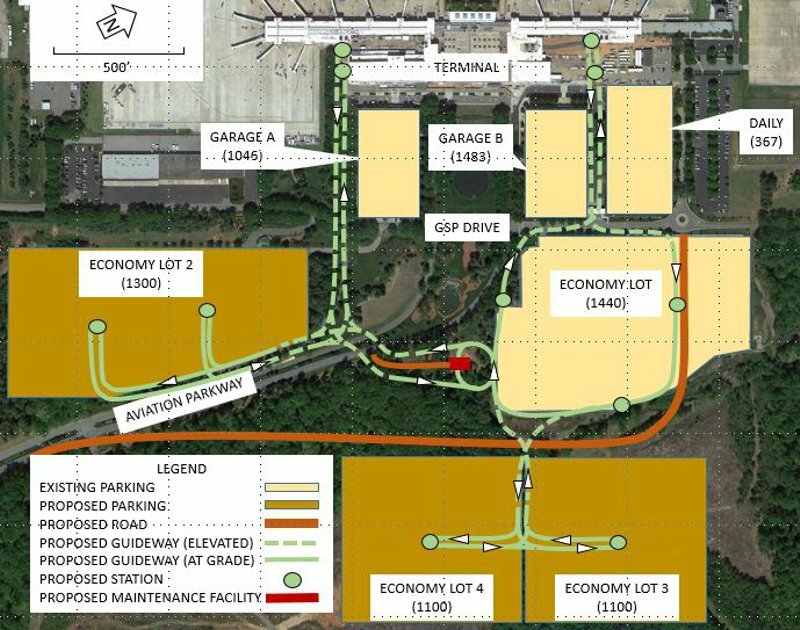 Project: Conceptual-level feasibility analysis of a PRT system linking two long-term parking lots to an airport terminal. The project established preliminary guideway routing and station locations. Capital and operating costs were determined and compared to those of the existing shuttle bus system. Project: Safety and security research of an automated small vehicle transportation system on a university campus. This project examined the threats and vulnerabilities related to PRT safety and security, as well as means and methods for their mitigation. Overall PRT safety and security was evaluated in comparison with conventional modes of transportation. Role: Project management. PRT Consulting was a subconsultant to Olsson Associates, the firm Peter Muller was working for when he was appointed project manager for this project.